Approaching the seasonal period of the year means one guarantee in football, a congested fixture period. While managers bemoan the demands on their players (who get paid enough, so man-up! ), it’s the regular away supporter that gets hit the most. Especially in their pocket, in terms of travel and ticket prices. With that in mind, the above table seen in the Daily Mail and compiled by the website GoEuro, works out according to the website’s calculations, how much fans will be paying for each minute of the football they watch. 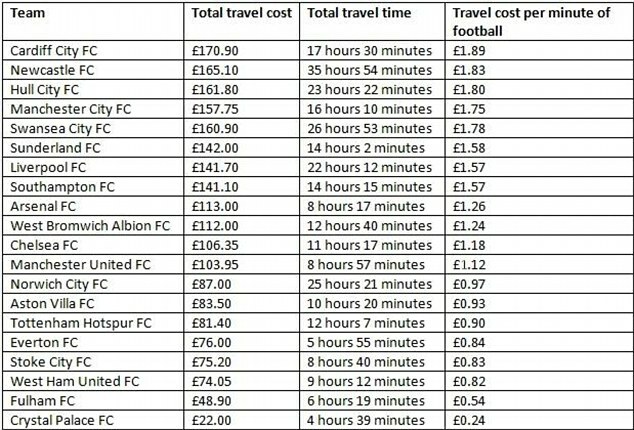 Whether it calculates some of the away ticket incentives and free coach travel is another matter, but at least it’s a rough guide. Looking at the table, the Geordies have got it the worst. But, hey, that’s what you get for living up there in Scotland…(as we like to say to them, when they come to Villa Park). Newcastle fans will spend a massive 35 hours 54 minutes (ten hours more than any other club) following Alan Pardew’s men with away days at Swansea, Manchester United and Crystal Palace in December. In terms of saving a few quid for Christmas shopping and drinking, in the final month up to Christmas, Aston Villa away supporters are lucky to have a couple of Midlands’ derbies against West Brom and Stoke for short away trips. Although, back-to-back away games against the Saints and Fulham in the space of four days in early December is a bit of a drag. If the table had included games on January 1st, which would make more sense, since it’s the seasonal holiday period, Villa fans would have found themselves much higher up the table, since they face a long trek up to Sunderland on New Years day (I think there is a ‘kid’s for a quid’ scheme and some free coaches to lessen the blow for some, at a difficult time to travel). Well, we didn’t do the table…but in this period: Everton’s away games Man Utd, Arsenal, Swansea / Liverpool’s away games: Everton, Hull, Spurs, Man City, Chelsea. So Liverpool do have two more away games (although one is against Everton!). Only really significant one is an extra trip to London. I think they calculated it on using coach & train via the website that compiled it – GoEuro. So it’s time it takes rather than miles. Utter bo11ocks!. How can Evertonians travel time be under 6 hrs, when Liverpool fans is over 22 hrs!!!!!! !